Structured much like the Denver Water Forests to Faucet program, the Santa Fe Municipal Watershed Restoration Project is a five-year PWS program to support forest restoration in the Pecos River headwaters. The water supply for the city of Santa Fe, New Mexico and nearby communities originates in the upper Santa Fe River basin and is provided by the Pecos River. The Pecos supplies two reservoirs that provide approximately one-third of the water used in the Santa Fe water system, which provides drinking water to over 30,000 households and businesses. 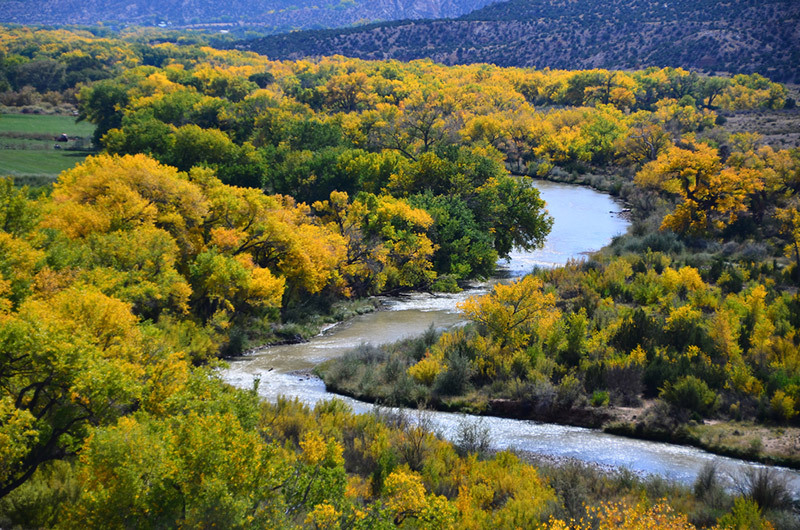 Rio Grande River near Santa Fe, New Mexico. The watershed is located on public lands managed by the US Forest Service (USFS) and comprises approximately 17,000 acres, of which 10,000 acres are within the Pecos Wilderness Area.1 As with the City of Denver, the drinking water supply for Santa Fe residents is dependent on maintaining a healthy forest and a watershed that is resilient to severe wildfires. The financial management plan for the watershed services payments involves a phased approach. Initially, during the first year of implementation, after the public outreach plan had been conducted, the city included the watershed services fee in water bills where it listed the fee as a separate line item paid for by water trust board funding. In the second phase, beginning in 2014, the fee appeared on customers’ bills, based on water use, and the customers were responsible for paying the fee. The average fee per customer is $0.54 per month, which is deposited into a fund supporting forest restoration. Based on average household use for the water system, this would result in an annual cost of approximately $6.50, which would provide nearly 50% of the funds required for forest health restoration projects in the watershed. The funds secured through this program are intended to also support long-term, ongoing maintenance and monitoring of forest/watershed health, which will build resilience to catastrophic fire, soil erosion, and invasive species. Thus far, the program has treated nearly 6,000 acres of forest through mechanical thinning and controlled burns.